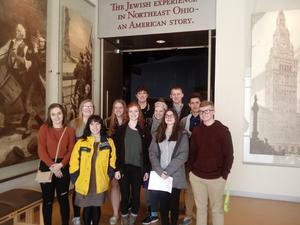 The AP US History class visited the Maltz Museum of Jewish Heritage in Beachwood. The class took a holocaust tour and heard from a child survivor. 126 students qualified for the Academic Letter Breakfast held on April 3 at Camden Falls. Dr. Ron Schumacher, President of Terra State Community College was the guest speaker. Jesse Nida, Manager of the Tiffin Hy-Miler presents Greg DeVore with a check for $500. 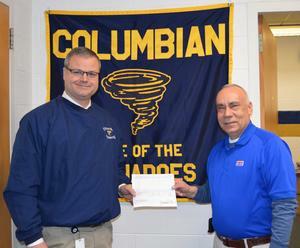 Columbian HS was the recipient of the Exxon Mobil Educational Alliance Grant for Math and Science. 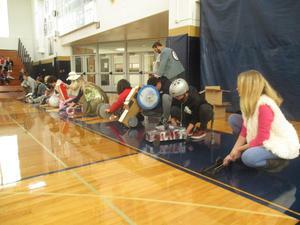 Design Class Racing Their Designs! This semester’s design class reinvented lockers for 21st century learners, engineered racecars that were powered by the potential energy of rubber bands, and investigated how to design a better playground for elementary students. Find a problem! Investigate! Brainstorm! Collaborate! Sketch! Prototype! Redesign! Reflect! GET TO KNOW THE PROCESS! 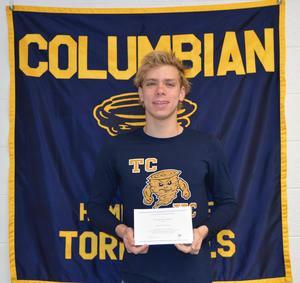 Kerrick Fanning, a Finalist in the 2019 Competition for National Merit Scholarship! 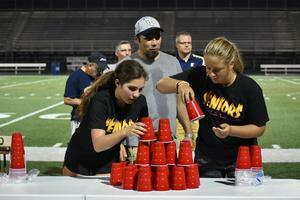 A long time Columbian tradition, The Clash of the Classes was held on Thursday evening. Classes competed against each other in events like the banana relay, egg run, Cheetos toss and tug of war. Pictured are Mr. Hartenstein counting the Cheetos on Freshmen, Grace Rinnert's head and Seniors, Carly Poe and Ava Sarka trying to build the tallest tower in a timed event. Seniors won Clash with a total of 27 points. Senior Students Ring Victory Bell! 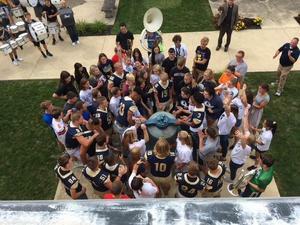 The ringing of the Victory Bell has been a long tradition at Columbian High School. Our senior students ended our first Friday of the school year ringing the bell to dismiss the student body. 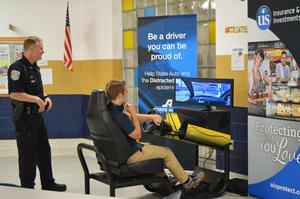 United Insurance sponsored a driving simulator to make students aware of the dangers of distracted driving. School Resource Office Doug Skornicka looks on while Logan Franklin attempts to drive the simulator. 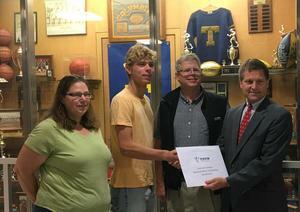 Congratulations to Kerrick Fanning who was selected as a National Merit Scholarship Semi-finalist! Kerrick is one of approximately 16,000 Semifinalists in the 64th annual National Merit Scholarship Program. 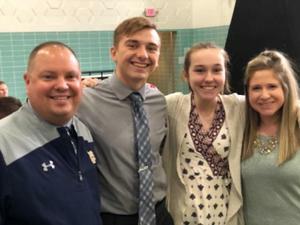 These academically talented high school seniors have an opportunity to continue in the competition for some 7,500 National Merit Scholarships worth more than $32 million that will be offered next spring. Congratulations, Kerrick on this awesome accomplishment! Kerrick was presented with a certificate by board member Dr. Andrew Gase. Kerrick's parents, Barry and Suzanne were also present for the ceremony.